Today as I did some extensive research on Cointellect latest activities and the reaction from the Cointellect community. Many affiliates websites closed down, deleted, such as facebook. Many facebook cointellect related to affiliate to cointellect, such as PR manager whatever they call themselves as recruiting members for cointellect deleted their facebook page that tied to cointellect. 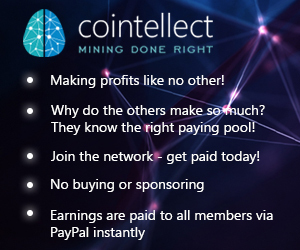 Simple reason is because these affiliates members tried to recruits members for cointellect, but in the end, ended up not getting paid, no one is getting paid, if any then it would be pennies to the new members or members that cointellect can manipulate to buy contract using Bitcoin or similar payment method not linked to credit cards. Credit cards holder, if you purchased mining contract with cointellect, you should immediately contract your bank and get your money back. File a dispute indicate services was not provided as expected and cannot get a hold of Cointellect staff, that’s good enough to dispute the payment. The latest news about Swiss Card or so call Debitcard, are just to kill time. Kill time to pack up and go. Maybe also their last effort to lure people in buying a mining contract with Bitcoin. Perhaps also having the miners continue to mine at their mining pools so they can pocket more dogecoins. More update coming as soon I’m doing many observation and interview with many people in chat room and forums, including many social websites.